I’ve just stayed for two nights in the Westin-branded Bonaventure hotel in downtown Los Angeles. I was keen to stay there and explore the hotel because it’s something of an icon in architecture and also a building that evokes strong reactions in people. Some of the hotel’s history is recorded at Wikipedia. The Bonaventure is a bit of a star in the city of stars. It has appeared in loads of movies and TV series since construction was finished in 1976. I’ve never really agreed with this idea. To me postmodernism is a capitulation to capitalist relations of production and a celebration of crass, kitsche consumerism as the new revolution. So is the Bonaventure a celebration of capitalism, or does the building condemn consumerism? …according to Jameson, the ‘new world space of multinational capital’ finds its ‘impossible’ representation in the mirror-glass and steel ‘hyperspaces’ of the Los Angeles Bonaventure Hotel and other contemporary urban megastructures. From a distance, and looking up, the Bonaventure building resembles a truncated spaceship. A series of cylindrical towers around a central core cylinder. For all money it looks like a Saturn V booster rocket array on the launch pad. This image is enhanced by the hotel’s external glass elevators. They appear like the infrastructure of the gantry; lifting astronaut-guests up into the darkened recesses of the residential towers. I’ve no idea what the Los Angeles cityscape looked like before the Bonaventure was built in the late 1970s; but now it does not appear out of place on the skyline. It is almost indistinguishable from the office towers that surround it. The building does invoke the arguments that Jameson made about it-it tends to keep out the world, to be almost a world within itself. There are around five acres of shopping space, but when I wandered around there yesterday (Tuesday LA time), it was deserted. The shops were all selling crap souveniers and expensive luxury items. There was a huge contrast between one store selling reduced-price luggage and others with pricey jewellery. In the luggage store I was offered a suitcase, original price $150 for $39.95 and a $35 travel wallet for $6.50. The store was managed by an old Chinese guy, it was not what you’d expect in a luxury hotel complex. I get the feeling that his lease is up and he’s moving out. On the lower level of the shopping arcade there are more upscale stores selling expensive luxe goods and jewellery. On the whole though, the shopping arcade was not very attractive. Perhaps that is the cultural logic of late capitalism. If you’re not buying luxe, bugger off. Jameson noticed a similar feeling of disorientation in the shopping galleries, but one major difference today is that there is now access to the lobby from outside. 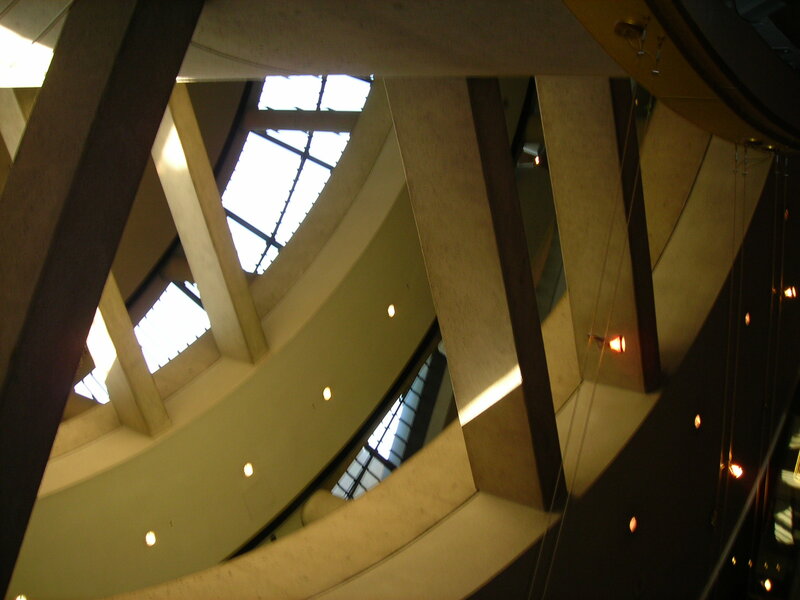 When the building first opened, the main entrance was on South Figueroa and to get to the lobby, guests had to go down an escalator. Now there’s an entrance on Flower street that allows same-level access to the lobby. There is actually a surprising amount of airspace between the LA towers. Much more than I remember in Sydney. The wide boulevardes and open areas between skyscrapers lets plenty of light down on to the streets. Inside the hotel it’s a different story. The interior is deliberately dark and moody. 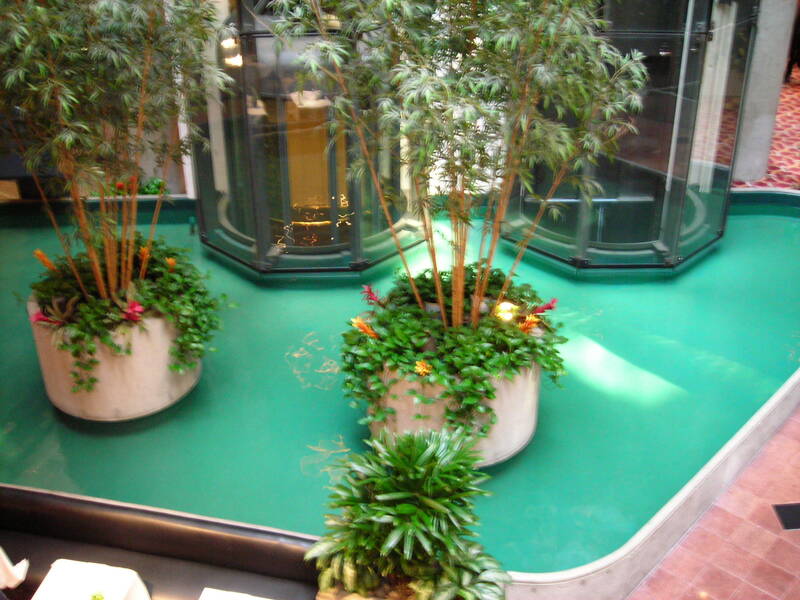 Reds dominate the lobby; relieved a little by the bright blue fountains and pools that snake around the circular core of the building. Bonaventure - a defensible fortress of pleasure? Significantly this fortress feel continues inside. There are battlements overlooking the lobby from three floors up, they’re almost ramparts where boiling oil could be poured down onto invading rabble. they actually contain those hideous “nautilus”-style exercise machines. This takes the whole ‘seen to be seen” mentality of this transparent city to it’s illogical logical postmodern conclusion. I didn’t see anyone using them while I was there. 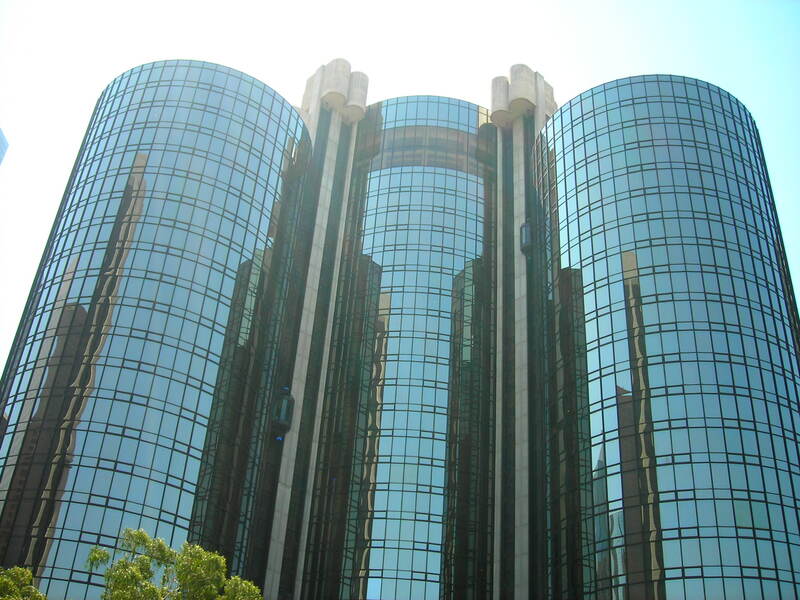 We see, then, that because of its economic function within the city that the Bonaventure Hotel is a normal element of the whole. It is designed to fit into the physical and economic landscape of the city, yet when you enter, it constructs its own “new” world. This new world, however, is not intended to contrast with the outside city as Disneyland is; it, instead, is designed to replace it — to become the outside world. The Bonaventure Hotel, therefore, provides an apt example of the resistance to late capitalism that is embedded within postmodernism. 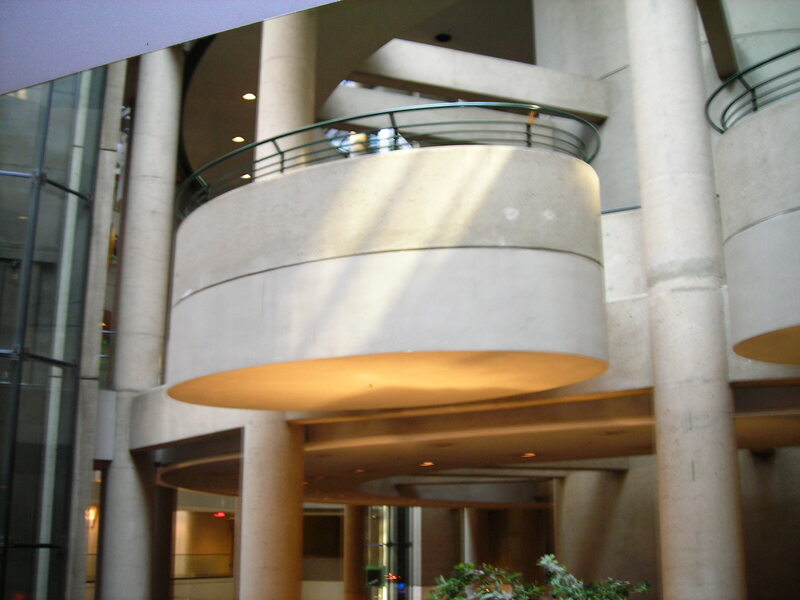 It is, as we have seen, the Bonaventure’s spatial manifestation of this postmodern expression that allows us to see its deterritorialization and the subsequent dilemma it poses to stores and, hence, capitalism. It is, however, capitalism’s response to this threat — essentially a re-signification of deterritorialization — that tends to mask the self-subverting elements of late capitalism. I don’t think this is quite right. There is no real resistance to capitalism any where within five miles of the Bonaventure hotel. Resistance doesn’t really begin until you get to places like Hollywood and Vine. Even there the resistance is visceral rather than intellectual. Of course on the southside of the city there is real resistance to capitalism as there is in other parts of the USA. There resistance is provided by people who would not normally be admitted to the Bonaventure, except as domestic or wait staff. A city like Los Angeles, for all the whiteness of Hollywood, cannot sustain itself without the labour of it’s vast and diverse underclass. That is why I mentioned Mike Davis, and City of Slums. 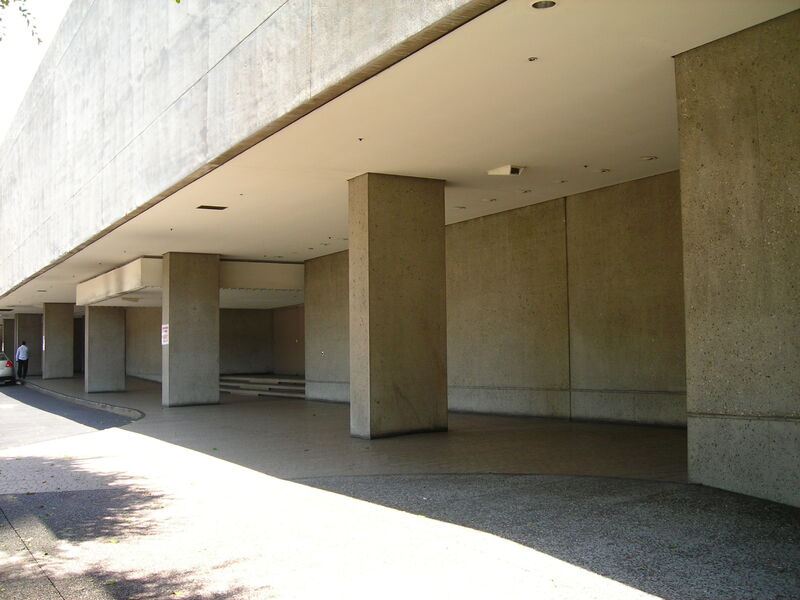 If you want to know about resistance to capitalism and it’s relationship to modern architecture, don’t venture down to the Bonaventure, look at the teeming and desolate places on the planet that Davis invokes. Bonaventure – a defensible fortress of pleasure? This entry was posted on Wednesday, September 10th, 2008 at 12:02 pm and is filed under political economy, pop culture, postmodernism, Uncategorized. You can follow any responses to this entry through the RSS 2.0 feed. You can leave a response, or trackback from your own site. I sense some Fear And Loathing in LA? Hey Nedska, just a little. I flew over (well somewhere in the “over” vicinity of) Owl Farm last night, so I’m sure I caught a whiff of those little flecks of Hunter that are whizzing around in the jetstream and 30,000 feet. Sounds like the Bonaventure didn’t quite live up to expectations, although the sunshine on martinis looked very pleasant. LA seems unfriendly, sterile & those in the community suffer inequality everywhere they would go but I gather from other reading that that’s exactly how the whole LA thing truly is. I’m curious now as to whether this trend will follow you across the US. I am interested in the photograph of the martini. I can,t tell what is in it. Wonderful picture. You said it was taken at the Bonaventure hotel. Can you tell me more about the drinks? Love this post. This is exactly what Baudrillard was describing. Thanks for applying Jameson and Berger to your trip! Interesting point about this building, it was inspired by Sydney Opera House, Oslo Opera House, Dancing House, Prague and Guggenheim Museum, Bilbao.